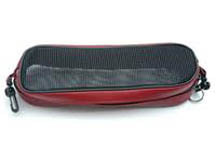 The Knilling Shoulder Rest Pouch is designed to hold shoulder rests on the outside of the violin case. Since many players have cases that have inadequate space for the shoulder rest on the inside, Knilling has designed this pouch so players can keep the shoulder rest with the instrument and not lose it. Your shopping cart is currently empty. Please select the items you would like to purchase from our catalog.